I apologize for the lack of posts but I’ve had a short and hectic summer. So, this post is a few weeks late but it was a great trip and I wanted to make sure to report on it! Last summer, Justin and I made a trip to Little Harrison Lake where we planned to traverse off trail to Harrison Lake and climb Harrison Peak. Although we were able to complete the traverse to Harrison Lake, rain and storm clouds prevented us from summiting the peak. We vowed to return to the mountain and so that’s what we did a few weekends ago. Friday morning, Justin and I were joined by our fellow crew member Connor as we set off. The plan was to camp at Two Mouth Lakes (one of my favorite spots in the Northern Selkirks) and use it as a base to summit Harrison Peak. 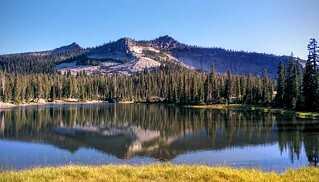 This approach is north of the mountain and although not the most direct route, it is possible to visit some beautiful unnamed lakes and have an exciting off-trail adventure. 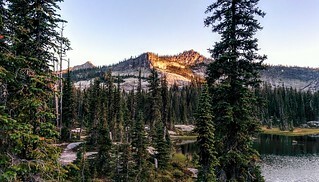 The trail to Two Mouth Lakes is about 4 miles long and we quickly completed the hike and set up camp at the lower lake. 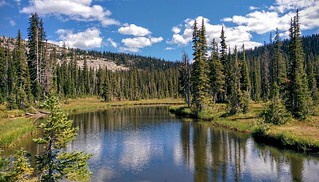 The two lakes are generally connected by a wonderful marshy waterway of pools and granite waterfalls, but unfortunately dry conditions this year had most of these features dried-up. Fire restrictions prevented us from having a camp fire but we nonetheless enjoyed the subalpine sunset and clear starry sky. 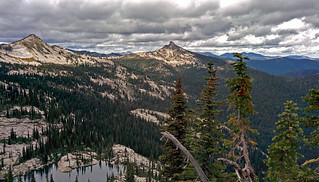 Saturday we grabbed our daypacks set off on the roughly 3 mile bushwhack to the peak. 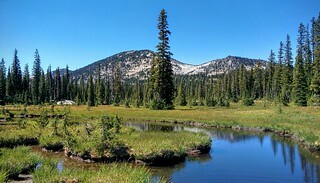 As you climb out of the Two Mouth basin towards unnamed Lake 6291, the Rhododendron and False Azalea provide a thick and formidable wall of brush that must be fought through. It was slow going as we pushed through encountering large downed trees, wet marshy areas, and steep-sided boulders. 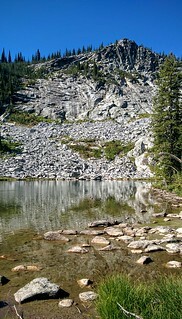 Lake 6291 is small and forested, but features a rocky ridgepoint above it. 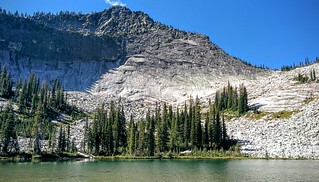 Another thick bushwhack around the ridge brought us to the larger unnamed Lake 6321, which sits beneath the false-summit of Harrison Peak. This spectacularly beautiful and pristine lake sees very little human use and is a wonderful and remote place. From here, the goal was to get onto the eastern ridge of the peak. To do this, we first skirted the base of ridge and found a point we thought we might be able to cut up through the brush and cliffs. Unfortunately, it got too steep and brushy, so we retreated back to the base to work further down. Finally we found a fairly easy scramble up the ridge and we were soon on it and working our way to the summit. The trees along the ridge are thin and scattered, making hiking quick from this point. 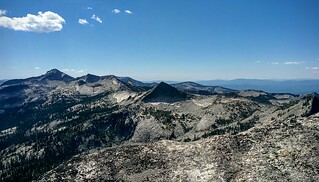 As we reached the rocky pinnacle that forms the summit, we scrambled up the cliffs on the north side. On top, we were standing on what is basically a knife edge that overhangs at an angle with a lot of air underneath. From here, it was a short but airy boulder hop up to the high point on the south of the ridge. The view was incredible and although Justin and Connor seemed fearless, my legs were a little wobbly when I got near the edge of the most overhanging rocks. Overall though, it was well worth it and we fought our way back through the brush to camp. The next morning, we awoke early to rain and quickly packed up things. This was a fantastic trip and although it was a tough and slow off-trail hike, I think we all enjoyed it because the view provided a great payoff. 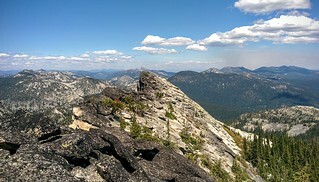 Most people approach this summit from the Harrison Lake trail, which is on the south side of the peak. This route however allows one to camp at the much prettier Two Mouth Lakes and to travel to a few little lakes which few people travel to. Enjoy the video! Excellent posting job….Leo and I are planning a hike to that 6321 over Labor Day, because of your post and because we lost our reservation at the beautiful BigHornLodge from that awful “Napoleon Fire”. I am praying and hoping that the BHL survives ! Dave’s leg is healing fast, however, like a courageous captain “He is staying with the ship”. Just imagine, a one legged sailor, fighting a fire, with a garden hose ? We miss you table production, and we miss your stories too. You know what, after 13 years, Luis finally said “goodbye”. He wants to get the heck out of Dodge and relocate to “Equal-dor”! Yea, imagine that, everything is equal down there, everyone has the same thing; the “nil set”. Guess I’m a little “bummed” out, Luis is a great guy like you are. 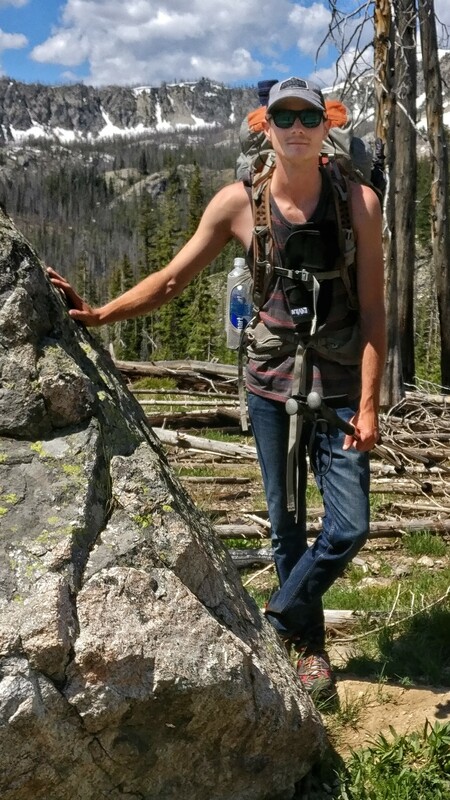 Keep posting, keep hiking and see you on the trail sometime ! 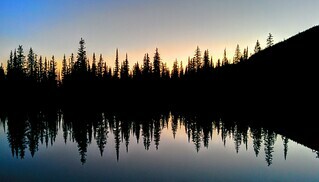 I’m glad to hear this post inspired you visit to lake 6321. I think you’ll like the Two Mouth Lakes area even if it does sometimes get overused. I know Leo really likes it there too and you two will certainly be able to find some solitude. I drove past BHL on my way to Missoula and yes those mountains are definitely burning down. Hopefully the Lodge survives (as well as firefighter Dave)! It’s sad to hear that Luis left, he really was a great guy and he I hope he makes it to wherever makes him happy. I also miss CampTime and you guys. Enjoy the Selkirks and we’ll stay in touch!